Krishna is the most popular avatar of Vishnu. He spent his entire childhood in the courtyards of his faster parents, Nanda and Yashoda. Poets and artists have taken special delight in portraying the antics of this delightful child. Avoiding the gaze of the viewer, Krishna directs the light of his eyes else where - the eyes full of innocence. There is something about his face that captures our attention; maybe the wide forehead with the mark of Vishnu, or the childish cheeks or perhaps the smile that says he is aware of his charms. The artist has very successfully depicted the naughty, playful, yet innocent expression associated with childhood. A small crown rests on his thick, curling hair; armlets, bracelets and rings decorate the limbs of the adorable son of Yashoda. 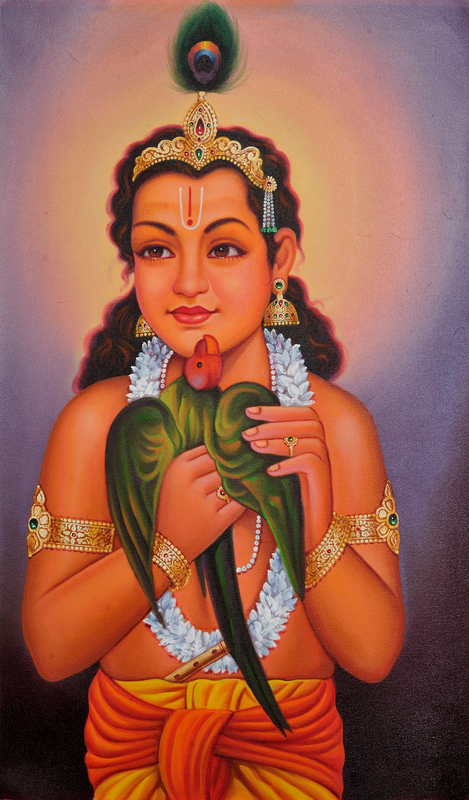 If and when, we can divert our gaze from his face, we notice him playing with a parrot who is trying to reach his face. Krishna's flute is discreetly tucked in his belt, waiting for its turn to reach his lips, another means to charm those around him.